I took the role of big sister very seriously, fully embracing my new responsibilities in taking care of Windee, most of which were self-assigned, and quickly becoming a “good little helper.” Of course, the household revolves around a new baby. There is really no way around that, and there probably shouldn’t be. My naturally compliant personality and fascination with my little sister made this a fairly easy transition for me, at least as much as I can remember. I hovered and helped whether it was needed or not. She didn’t even need to talk on her own; I spoke for her. She could tilt her head and twitch the corner of her mouth, and I knew with certainty that she wanted to ride the pink plastic pony with wheels instead of the blue. Keeping her happy and content was as much my job as my mother’s. She was the center of my world, and as soon as she began to walk, the two of us were rarely apart. There are no feelings of jealousy, no resentment among these memories, but there is the faintest sigh of resignation here and there. Windee giggling in Daddy’s arms as I waited my turn. Windee always in Mommy’s lap (she is still a baby, I know) while I stood by remembering when that was my place. Any of you with younger siblings know what I mean. Don’t misunderstand, I was lavished with praise and showered with affection, but the youngest needs more attention from her parents. I understood this. I accepted this. A particular moment remains one of the most vivid memories from my childhood. Playing in our shared room, I had apparently found some odd item that belonged in the trash can. Leaving my little sister, I walked with it down the hallway and across the living room toward the kitchen. 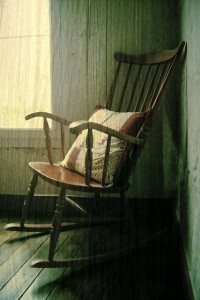 My mother sat in the rocking chair with her head leaned back, taking a moment’s rest before beginning dinner. Her eyes opened at the sound of my feet, and she asked what I was doing. I answered, continued to the kitchen, pleased with myself for being able to help her keep the house cleaned up. I remember the thought “just me” going through my mind. I hesitated long enough to repeat it to myself, then stepped forward. Squealing and bouncing, my little sister erupted into the room, danced/ran/leaped to our mother and threw herself against the lap I was heading for. It was then we noticed she was wearing only a shirt. After a few questions and her nodding emphatic yesses, we figured out that she had taken herself to the little potty seat all on her own, I think for the very first time. This was cause for big celebration, as you can imagine, so we made a huge deal over her accomplishment. We also helped her find her pants. The almost important moment with my mother was forgotten in all of the excitement. But I’ve wondered lately if the important moment was the one that did happen. My mother saw me. She smiled at me. She reached for me. That was enough to make this a memory I have visited again and again. Well, that and the silly, sweet interrupting of a half-naked, giggling toddler of a sister. This entry was posted in just me, truer stories and tagged almost, big sister, mother daughter. Bookmark the permalink. This is beautiful and touching Jonnia. As an older child myself, it is a bittersweet place. Thank you, Michael. I can’t help but look back over the time when my own two oldest children were younger and ask myself if I did enough to make sure the sweet outweighed the bitter. I hope. I was the little sister.Rosalee was 9 years older and she was the one who watched over me.I miss her being a part of my life .We hardly know each other,but those memories of the care she gave me are fresh in my mind.